Some people think Microsoft releases so many products that when the information about them is needed, it’s impossible to find it. I tend to agree with that assessment, and finding information about the server product named Windows Storage Server 2008 R2 is a perfect example of this problem Microsoft has with releasing so many product versions and communicating little about them. So, let’s take a look at this and see what’s out there. Summary: I take the time to go over the various important concerns about the versions of Windows Storage Server 2008 R2 available. 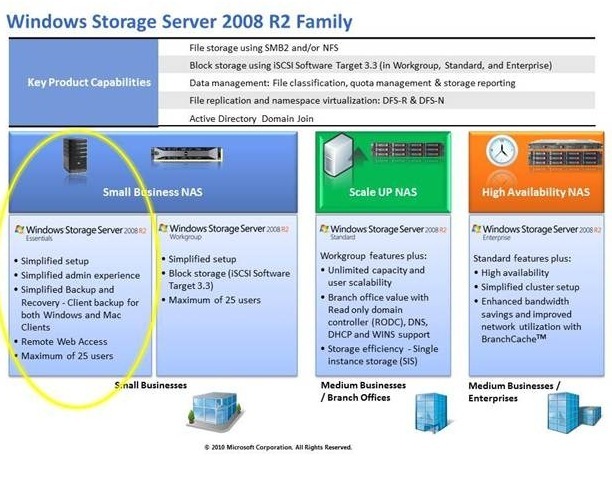 If you want a NAS device and want that device to have a version of Windows Server on it, a general no-brainer is to think of Windows Storage Server 2008 R2 (WSS2008R2 for short). There are a number of things to consider that could be big problems later-on if you aren’t careful. That’s something to consider since the size of you company may be close to this or growing. A product that currently uses the WSS2008R2 Essentials product is the WD Sentinel DX4000 NAS server. The Essentials product is only sold and licensed to OEMs that build devices specifically used for WSS2008R2. The Enterprise product is likely only sold to partners and volume license customers. Versions of WSS2008R2 do support what we might consider a backup domain controller (or read-only controller) but this OS was never intended to be a full-scale directory server. This is a good thing to know when deploying the server in your environment. #5. Administration is done by way of remote desktop or a HyperTerminal. Many of the NAS devices you’ll buy, such as the WD Sentinel DX4000 will have no video card. So, here’s a chart found at the Windows Storage Server 2008 R2 announcement blog. I know, catchy name for a blog. The next logical progression with this product line is looking at it’s similarities and differences with the Windows Home Server and Small Business Server. Surely, both of those products share a number of different tools and features as WSS2008R2, but that may be a blog for another day. I can see this product used in a number of ways – from consolidating user shares, to handing a branch office’s authentication duties, there is definitely a use for this (even if Linux is the dominant player in the NAS space). I wish that Microsoft was clearer about these products – names like “Workgroup” and “Standard” are very poorly worded.